You can send me a message at bobwinsor1@msn.com. We bought this rig in April. We've put lots of miles on it this summer and had some great times. 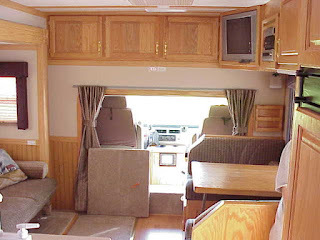 The truck conversion platform is a great way to go if you want a very heavy duty motorhome. The cab ride is very firm (Mrs. says it's too bumpy but I like a truck ride). I'm a firm believer in truck conversions for most people. I'm hoping we can get it out for some more trips before the snow comes. My brother wants to take it out to California in December for a dog show that one of his dogs qualified for. I don't think I want to take it out on salty roads tho. 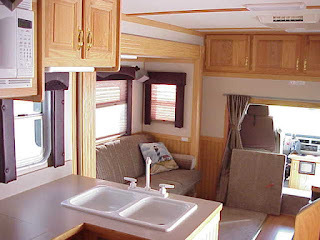 More pictures of our motorhome. Thank you very much to the new owners! I believe you will really enjoy this motorhome and it won't give you any trouble. Thanks to everybody else for your interest. We decided to implement our own economic stimulus plan. We bought a new motorhome. We have owned a very nice '92 motorhome since '04. That one has served us very well. The problem is that it isn't strong enough to pull a heavy car trailer. So, we purchased this little beauty on March 6th. We found it on a lot in Cedar Rapids, IA. I had gone down there last summer as part of the St. Paul Police contingent helping with the huge Cedar Rapids flooding. I saw Wright-Way Trailers (http://www.wrightwaytrailers.com/) on the side of the highway and saw some of these coaches there so I've been following their inventory. They made me an extremely good deal on it. We will be picking it up in a couple of weeks. We've got to get the paperwork and funding in order. It's an '03 Freightliner FL112 chassis. It has a Caterpiller C12 engine and a Eaton 10speed autoshift transmission. The C12 is rated at 430 horsepower, 1650 lb./ft of torque. It's VERY powerful. The living quarters were built on it when the truck was brand new in '03. It's a 26' box. Very nice floor plan. Top quality build. The company that built the conversion is called United Specialties. They are a good builder. Lots and lots of storage. All the treats. It's also got a 40,000 hitch to pull anything. We're very excited. I'll post some more pictures when we pick it up. Wow, what a trip! The day of the inauguration was very very long and tiresome. We boarded the bus at our hotel at 2:45 am. We were on the pavement of the parade route at 4:30 am. Had to stand a line along Pennsylvania Ave. from 13th to about half the block toward 12th. It was about 5-10 degrees with a stiff wind from the start. They didn't even let the public into the parade route until about 8:00. We had to stand the line until 6:30 pm. We got warmup breaks throughout the day. They would let about 6-8 or us go at a time, the rest of the guys/gals would adjust their spacing for our gaps. We got about a 45 minute lunch break with box lunches provided, cold turkey subs, chips, pop (I had water since I don't drink pop). I bought several of those charcoal hand warmers and put them in my boots, gloves, one large one between my undershirt and my vest, and a large one in my hat. They wouldn't let us wear any wind/snow pants (we have great snow pants and wind pants that are part of our uniform but somebody higher up decided they wouldn't look good on us in the line up, stupid decision!!!). They said it reached 24 degrees but the wind never let up a bit and it felt very very cold all day. We never had any sun either, that would have been nice. We weren't allowed to turn around when the big guy came behind us. We had to be ever vigilant for possible attack from the crowd. Our sargeants were positioned behind us to make sure nobody tried to sneek a peek. It was the longest coldest hours of my 24 years. I didn't make very much overtime, 10 hours on the 21st is it. Not enough sleep time, and I took the pullout sofa so my roomate could have the one bed in the bedroom. The big huge speaker tower above me started out playing great soul pop music for the throngs of people. But after about 6 songs it became apparent that that was all the dummy brought as he kept repeating all those 6 songs all day!!! What a freekin' dope. As if they couldn't find some other good songs by black artists/bands. It was cool to be able to do it tho. We could purchase (and I did) a commemorative badge set that has a nice blue felt jewelry type box with a special badge, lapel pin, and coin, that were made up just for the cops working the detail. We didn't have to wear it either so I kept mine in the box so it wouldn't get mucked up. Maybe my grandkids will fight over it and one of them will sell it on ebay to buy drugs. I also bought a bunch of Obama souveniers for gifts for all my liberal family/friends. I even bought several boxes of Obama breath mint tins, they're a breath of change we can believe in. The people were very very friendly and appreciative of us, lots of "thank you"s and praise for our work. They sure do love their president to stand there all day just to see him walk by. They couldn't take warmup breaks or sit down because they weren't allowed to bring chairs in and if they left their spot they'd lose it. I'm glad I volunteered but now that I've done it I certainly won't do it again. Besides, I'm retiring in 3 years so they won't have another one before I'm gone. Maybe MrsBob86ZZ4 and I will go out there to watch the next parade, hahahaaha, don't think so. Yepper, gonna go out for this momentous event. A whole bunch of us coppers are going to assist with the detail. I'll be a bit behind him and to the left when he's being sworn in. I've gotta carry out Jefferson's bible. Just look for me. I'll be mouthing "Hi Mom" to the camera. And asking for a Dr. Pepper. Hahahaha, I'll actually be working on the parage route most of the day. They're telling us we'll be out about 4:00 am taking up our posts on the route to keep it locked down. After the parade I think we might be deployed to some of the large party sights for perimeter security. Flying out Sunday and coming home Wed. Gonna stay at the Embassy Suites in Vienna, VA. Turns out my cousin only lives a few miles from there so hopefully I'll get to visit with him and his family a bit while there. I don't plan on trying to see any of the sights tho due to the huge crowds expected. DC is one of the places on our "to do" list when we retire and go on the road full time in the r.v. I just created this site since my old web site host locked down all our sites and won't let us edit them. The site is still there under: www.corvetteforum.net/c5/bob96zz4 There is some old stuff there but there is still some pertinent stuff too. I'll be trying to get stuff moved over here as I figure this out. Plus, I figured Paula could post things here if she wants to.